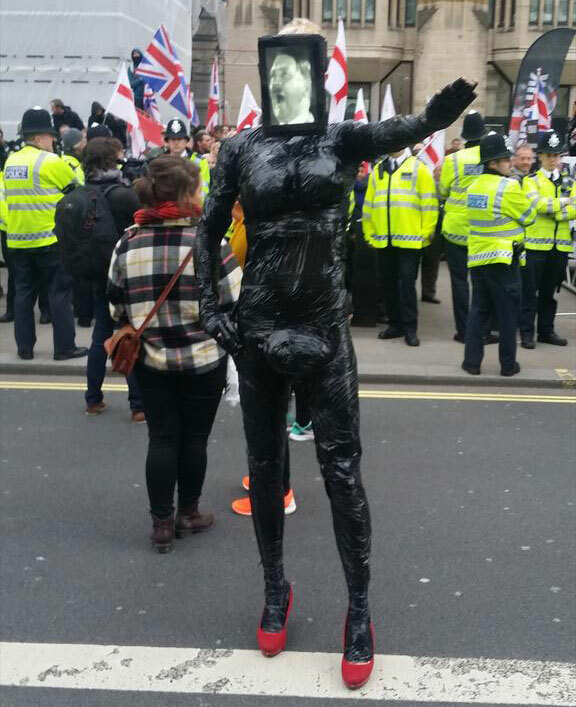 The mobilisation against PEGIDA in London yesterday was a resounding success. Rather than the tens of thousands their German parent organisation has managed to bring out on to the streets, PEGIDA UK managed about 70, among whom were many very familiar faces from the extreme right, including some notorious neo-Nazis, destroying their claim not to be a far-right racist organisation. 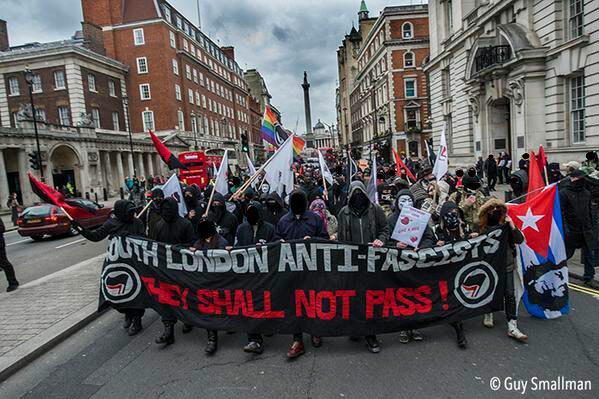 There was a counter-demonstration by UAF which attracted over 300 people and an ‘all-London anti-fascist bloc’ co-ordinated by London Anti-Fascists, South London Anti-Fascists, North London Anti-Fascists and Dywizjon 161 comprised of 100+ people. PEGIDA ended up barricaded inside a pub, surrounded by anti-fascists and having to be rescued by the police. The attempt to build PEGIDA in the UK appears to be failing big time – they managed a couple of hundred people for their first demonstration in Newcastle, where they relied heavily on the EDL and NF to make up the numbers. However, they were still opposed more than 10-1 by anti-racist Geordies. Their second outing in Edinburgh was even more risible, as only 4 people turned out for the demo, trying to hide and pretend they weren’t there as they were laughed at by a couple of hundred Scottish anti-fascists. They now appear to be descending into self-delusion in an attempt to save face. One PEGIDA member at the rally in London claimed to a journalist that there were in fact 200 of them and explained the photos showing far fewer by saying “a lot of our supporters don’t want to be on television”. Unfortunately for them, their main potential base of support – the EDL – was off being chased around Oxford by anti-fascists and couldn’t make it to London to bulk up the numbers. PEGIDA demonstrations in the UK have failed to appeal to any ‘normal’ people and have consisted of the same old faces from the far-right. PEGIDA organisers have not made any significant efforts to deter them and have even specifically invited some of the worst extreme right neo-Nazis. 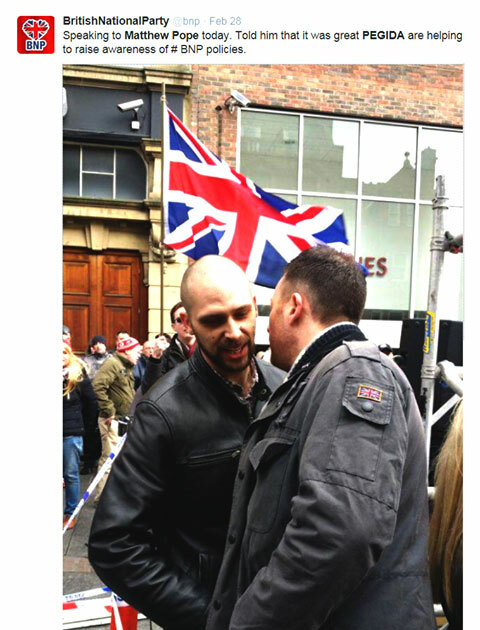 Last week EDL News caught PEGIDA organiser Marion Rogers inviting neo-Nazi Eddie Stampton. She later went on to claim she did not know who he was and he would be removed from the demo. 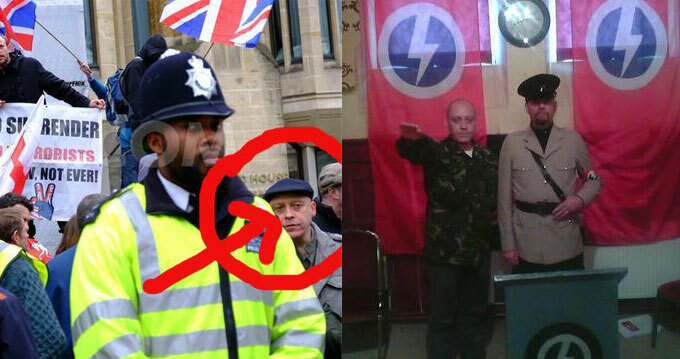 This of course turned out to be untrue and here he is pictured with fellow Nazi Colin McKay. It might have been better for Stampton if he had stayed home as he ended up locking himself in the toilets of the St Stephens Tavern to hide from anti-fascists! Following the embarrassing demo in London, Matt Pope, the leader of PEGIDA UK, who himself has far-right links, has now quit the sinking ship. We predict a short life for PEGIDA UK as it has failed to gain any traction as a brand and there seems little reason for the far right to continue with it rather than just marching under their normal brands of the EDL, NF etc. Saturday was a good day for anti-fascists. We managed to outnumber and ruin the EDL’s day in Oxford and simultaneously drown out PEGIDA in London. This shows a new level of organisation for anti-fascists – unity between different anti-fascist groups and being able to mobilise effectively in two places simultaneously, out-numbering and out-manoeuvring the far-right in both places. The next major anti-fascist mobilisation is against the March for England in Blackpool on April 25th. Like the EDL, they are another far-right group that has thought better of mobilising in Brighton and are trying their luck in pastures new. Let’s show them that the North West is no more welcoming for fascists than the South East. There should be transport running to Blackpool from Manchester, London, Sheffield and other locations around the country – contact your local AFN group for details. The fascists’ next outing in London is an EDL national demo on May 9th in Walthamstow. Given that the last time they tried to march in Walthamstow a mere 200 EDL were totally blocked by 2000 anti-fascists & pelted with eggs, and their ‘national’ demo yesterday only pulled 150 people max, it looks like we can expect another drubbing for the far-right in the capital.